Yes they are Labrits/ Pyrenean sheep dogs and by heck they certainly live up to there reputation, they do not take prisoners. If they don't like you or you invade the homestead you soon have your elbows, bottom or ankles nipped. The local rambo's keep well clear of Sue when she is out walking the dog's. Even i cannot enter her bedroom when the boys are on guard. 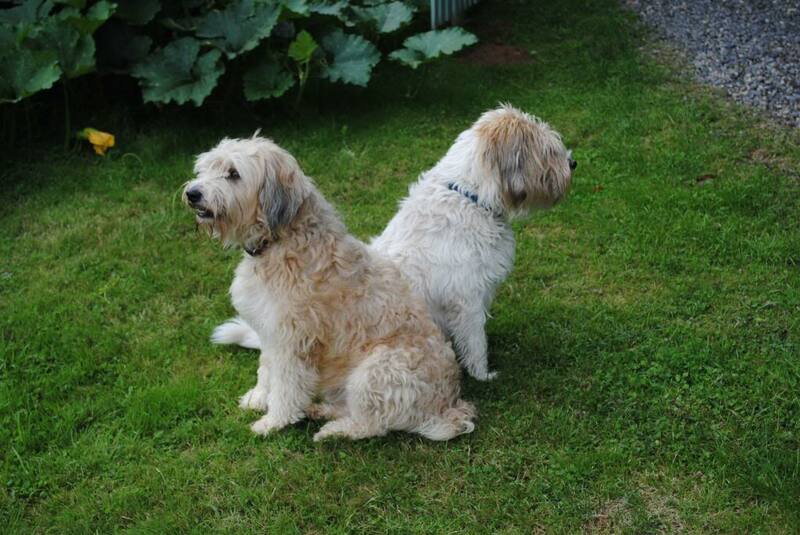 Gizmo on the left and Lucas on the right I think - is that right, Chris - they are lovely dogs and that's a fab picture of them down your garden. Looking forward to the next time we come over and I can give them some fuss (with Herbie and Lotti of course) ! Keep taking the pictures (Sue). K.
Funny enough these two are sort of self cleaning, we only rub them down with towels after walks in the rain. Show these two a bath tub with dog soap and water and they are dust on the horizen. We take them to the Dutch lady at Meymac who is the dog grooming Champion of france and she gives them a cut in spring. Lucas hates it and it takes three of us to hold him,with a muzzle on him. Even then he's up for it and really gives us the old one two. Gizmo on the other hand can not get enough of the fussing and lets you do anything with him if you are grooming him. Our vet in Egletons was horrified when we asked for dog shampoo for them, he said they are pyreneans they either go in the sheep dip or river or lake you never never shampoo a pyrenean sheep dog. So this is how they look most of the time. Simmo in the Correze, with the boys waiting to give the postie his daily run for his money,They even try to bite the tyres out on his van!, it must be the yellow that does it. That's a very handsome boy, Irene. Lots of very lovely dogs! My friend has a labrit... lovely dog and indefatigable as well. An hours walk (run) off lead in the woods plus half an hour swimming non stop in the lake, and still full of beans... and that is just in the morning ! More of the same later later in the day. Thats a lovely dog you have,looking at him he has all the great newfoundlands good looks, is he a pedigree?. I can not get over the fact he does not like water as they can swim for miles and really enjoy a good swim in the sea. In the military i was on a search and rescue course in Germany and the Canadians had one. it would swim out to us, we would grab its harness and it would tow us for miles even in our survival suits. He is a pedigree, but one of the "smaller" Newfoundlands - only weighs 65kg! He's 9 next week so getting on a bit. 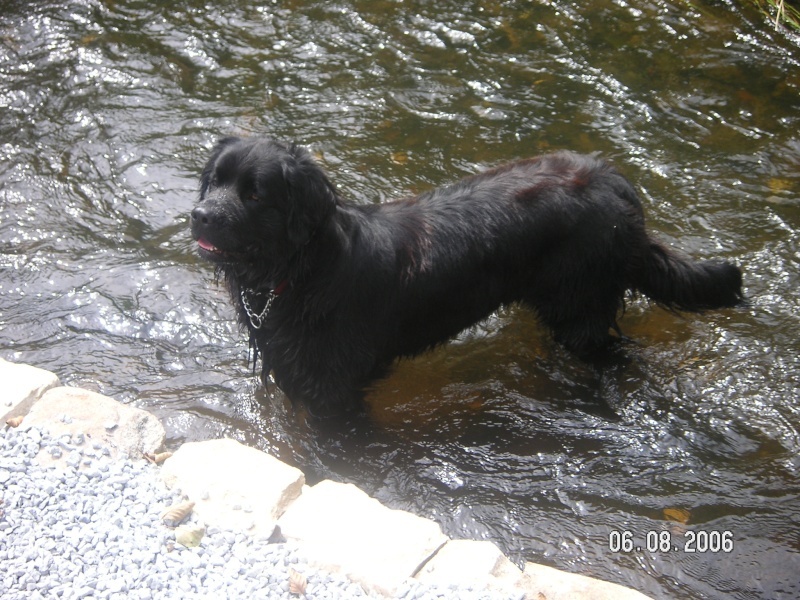 He's never liked swimming though does like to stand and cool off in the river (but not have a bath). He can of course swim when he has to. We've tried him out on the lakes. My husband says he wants his money back. Only joking, he wouldn't be parted from him, I bought the dog as a Christmas present for him when I used to travel back to UK mid-week for work so that he would have company and now their like siamese twins - never parted. Irena wrote: .......... and now their like siamese twins - never parted. I thought you meant your husband was very black and hairy and likes standing in water to cool off!